• I’ve posted supporter acknowledgements from the surveys I’ve received so far. If you haven’t answered your survey yet, please send it in. Also, if you move, please let me know so that I can update your address to get your reward to you! 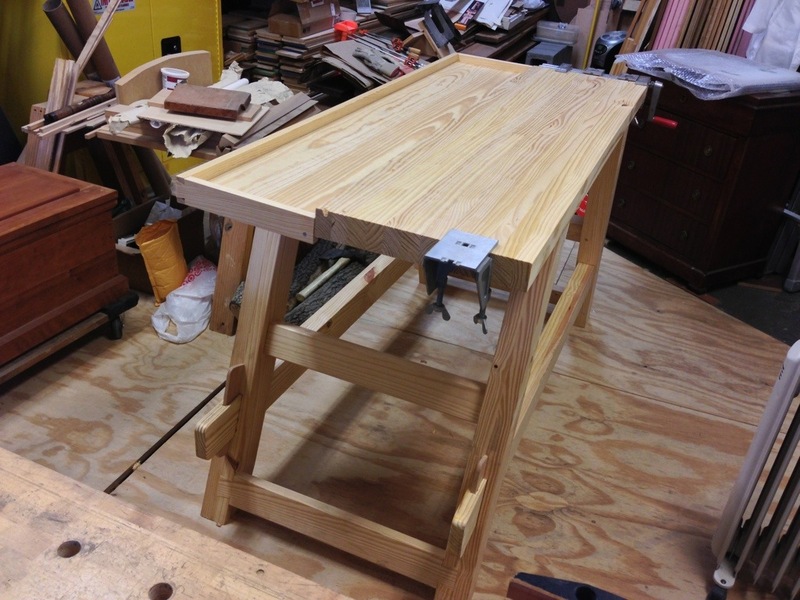 • I just finished up a portable workbench build based on a design highlighted by Chris Schwarz – the Moravian Workbench. The first and last images show the original. • Our woodworking club just completed its first ever seminar, hence the need for the aforementioned workbench. Karen Wilson, and Donna Hill, both contemporaries from the Marc Adams School, joined us for the event. • Finally, on the topic of the Oeben, I’ve been working on drawings, and dimensioning pictures to create the mechanisms (in between all of these other activities!). Since mid-February, I’ve been talking with David Lindow (David Lindow Clockmaker) about taking on this task.